Machine 2 Fish is an installation in which the movements of a true living goldfish are being robotized by an experimental robotic system. 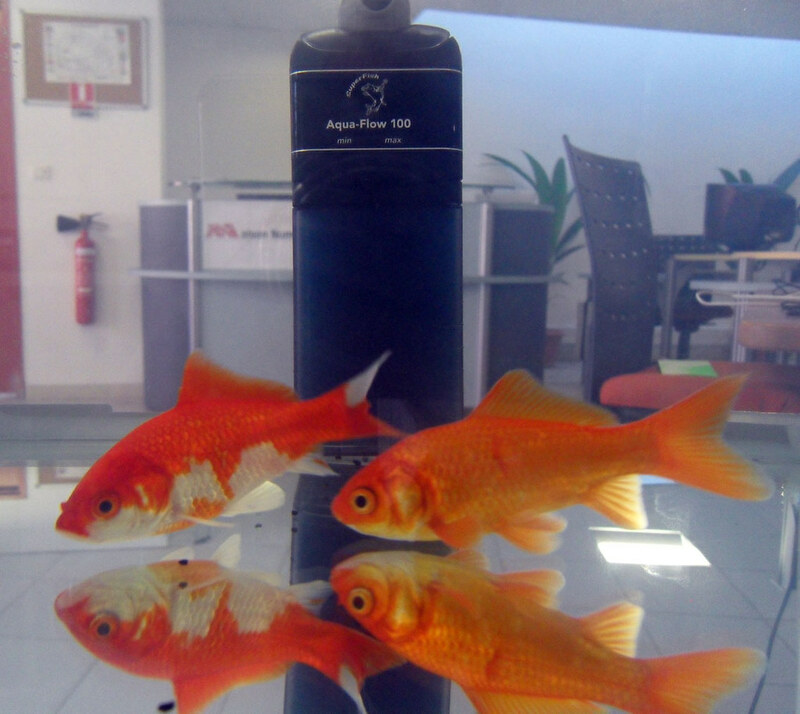 Thanks to its prosthesis the goldfish can move as if in an earthly environment. 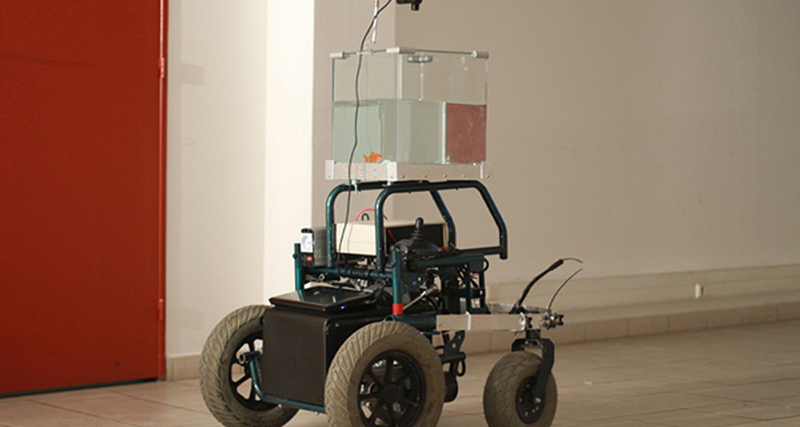 The fish and the machine combine into a smart autonomous device inspired by cyborgs and bio-mimetism. This installation has been realized with the help of Ivan Chabanaud, Julien Marro Dauzat and Gregoire Lauvin. The Dardex-Mort2Faim art group gathers several artists, Quentin Destieu, Romain Senatore, Sylvain Huguet and Stephane Kyles. They are engaged in an exploration of the notion of play, reprocessing popular aesthetics and underground culture, thus underlining the frailty of social relationships and the human body confronted with today’s world. Because they appreciate the video game “8 bits” universe and the computer and networks revolution, they express themselves in installations and happenings using interactivity and games. Creator of M2F Creations association and GAMERZ Festival, in Aix-en-Provence, they collaborate with the International Centre for Art and New Technology in Praha (CIANT). They have also presented their works on a regular basis since 2003 in various exhibitions and festivals in France and abroad. As a precursory artist working with digital materials, Ivan Chabanaud started his researches in electronic culture in the 90’s with structures such as ART 3000 with the production of 3D videos and virtual realities, and the Centre International de Création video (CICV) with the immersing “Icarus” installation. applications. Following this period, he joins the Scène Numérique project at the Théâtre du Merlan with Alain Liévaux and Jean-Michel Bruyère for the production of the digital part of living art shows and web projects. Now he develops his activities within Chabalab around the “multi-users” and “real-time” notions. He takes part in the “Réseaux Arts Numériques” workshops with some propositions about the capture of physiological data and their processing.